To me, the most beautiful country in South Asia — maybe, even the whole of Asia — is Sri Lanka. It’s not only that it is shaped like a pendant, the whole island is a jewel; the real Emerald Isle that most of us think refers to England. I go to Sri Lanka whenever I get the chance. To meet friends or on work, yes, but also to unbend and visit places that dot the island, each more interesting and satisfying than the last. Thank goodness there are still lots that I haven’t seen! As always, we travel with friends who enjoy the same things that we do, and in Sri Lanka, our most frequent companion and guide has been my good friend, Malathi de Alwis. Mala and I have been on many memorable trips together, but it’s the less-travelled road that I took with her to the natural parks and sanctuaries that I want to tell you about. It’s amazing just how many sanctuaries there are on that tiny island, but it does explain why many Sri Lankans are born ‘wildlifers’, and why their nature reserves are so cherished and well-managed. Driving up to Jaffna some time ago, we stopped at Wilpattu, Sri Lanka’s most famous national park — closed to visitors for more than 15 years because it had been taken over by the LTTE. Situated in the northwest of the island, its dense forest cover made for an ideal hideout for LTTE cadre, and its relatively remote location made access difficult. This is probably the oldest wildlife sanctuary in South Asia, having been declared as one in 1905. 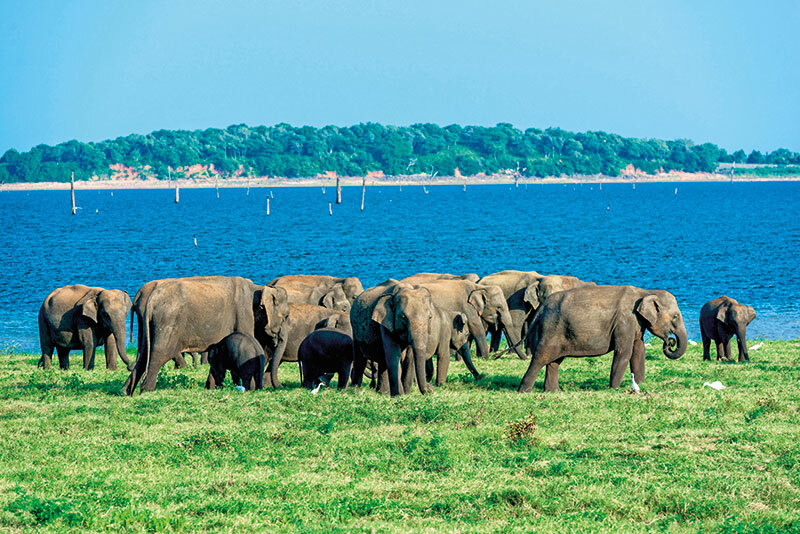 Wilpattu, which translates roughly as land of lakes in Sinhalese, is spread across 131,693 hectares, and has 50 wetlands — called willu, or shallow natural lakes, around which are located the ubiquitous circuit bungalows that the British are known for. Around these water basins are grasslands and open plains teeming with birdlife and butterflies. We were going to be staying in one of those bungalows at the edge of a willu, and having seen them in photographs, romantic and mysterious in the early morning light, we were rather impatient to get there. It took us one hour by jeep from the entrance of the sanctuary at Hunuwilagama to get to our bungalow — that’s how deep into the park it was. It was late evening when we arrived. The sun was going down and the lotuses glowed softly in the dying light, while blindingly white egrets dotted the deep-green grasslands around. Electric lights are a no-no in these forest bungalows, and so in the light of our lanterns we spoke little, listening to the sounds of the jungle, the flurry of wings, the rustle of small creatures, the elephants trumpeting. Waiting, as night fell, to sight a leopard or two. Wilpattu is famous for its Panthera pardus kotiya, and we were sure we would see at least a couple of its resident population of 50 leopards. Well, we didn’t. Primarily because it rained more or less throughout the two days we spent there, and though we saw plenty of spotted and barking deer and crocodiles and jackals, the leopard eluded us. One morning I decided I was going to sit it out at our bungalow and wait for the leopard to come down to the water for a drink. An impressive elephant emerged from the trees across the willu and ambled into the lake. He then made his way around the full circumference of the lake, pulling up weeds and grass and munching slowly, savouring each mouthful before he moved to the next. It took him at least a couple of hours to finish his meal, and I was so rivetted by the sight that I quite forgot about the leopard. Good thing, too, as it had evidently decided not to risk a trip while Jumbo was around. Watching an elephant going about its business from a safe distance is one thing, but a close encounter with a herd of pachyderms is quite another. On another occasion, we were in the Udawalawe National Park, in the south, out in an open jeep with a couple of forest rangers (because you cannot go into the jungle on your own). We were delighted by the sight of a very young elephant cub that seemed to have just discovered the joys of slurping up water in his trunk and squirting it out. On and on he went, till he realised suddenly that he had lost his parents, and his herd. Panicked, he began trumpeting in fright. Before we knew it, we were sandwiched between an elephant herd behind us and one in front of the jeep, as anxious elephant elders tried to coax the little tyke back to safety. “Don’t move,” the rangers said, “don’t make a sound.” A herd on the rampage can trample you to death in no time. The herd in front was some hundreds of yards away to our right, but the one behind us was pawing the ground, waiting for the lead elephant to give a sign, before charging. We were frozen stiff. Minutes, longer than hours, passed, and then we saw the little fellow scampering across the grass to the farther herd, finding his mama, and being surrounded in a protective circle. That was close! I have never been so relieved at the sight of a reunion between mother and child. “Birds,” I said to Mala for our next trip; no immediate danger there, they’re small and far away and I don’t really care whether we see them or not. “Okay,” she replied, “we’ll go to Singharaja, which is lovely, with lots of birds.” Now, I’m no bird-watcher, can hardly even spot them when they’re right in front of me, but I enjoy the adventure, the walks, the peering through binoculars, and surprising myself by being able to identify one or two. Mala, on the other hand, is a keen birder, knows every bird in Singharaja and in all of Sri Lanka, and is eagle-eyed. How on earth can she tell what that speck in the sky is? She just can. “There are leeches in Singharaja,” she informed me gleefully. “I hope you’ve brought thick socks to wear.” Socks? No one told me about leeches, all I have is my Crocs. She looked at me sadly and we decided to ask at the hotel for some. The ‘hotel’ was made of huge shipping containers which had been fashioned into ‘rooms’, one container as the bedroom and another, the bathroom. Quite inventive, and I have to admit, quite comfortable. Of course, the rooms were only the width of the container so if you were a bit large, it was a tight fit. The containers were situated in the forest, so — not being an early morning person — all I had to do to spot some birds was to step out onto my balcony and catch a few late risers amongst the population. Not at all kosher, I know, and Mala was quite disapproving, but I did accompany her on some lovely sunset walks, when she kindly pointed out a flock of white ibis returning home for the night. At Yala in the southeast, where we went before the terrible tsunami of 2005 struck it, I did make an early start or two to catch the birds, but that’s another story.